While a home addition is a big decision, it’s exciting to think about gaining new living space in your home. Adding a sunroom can provide an extended living area with natural light that brings the beauty of nature into your home. Patio Enclosures® offers several types of custom-designed sunrooms, including three season rooms, four season rooms, screen rooms, porch enclosures, traditional sunrooms and solariums. If you’re looking for a room you can enjoy year-round, a four season room may be right for you. A four season room is a type of sunroom enclosed with glass, which allows for breathtaking floor-to-ceiling views of the outdoors. The roof and frames of these sunrooms are thermally engineered so that the room can be heated and cooled year-round, making it a true extension of your home. Imagine watching a peaceful snow fall during the holidays, spending time with loved ones indoors without having to brave the brisk weather! A four season room offers additional space for you and your loved ones to gather 365 days a year while still maximizing your views. You can enjoy the sun on a sweltering summer day from the comfort of your own sunroom, without having to feel the heat of the sun or deal with bothersome bugs. What are the Benefits of a Four Season Room Addition? One of the main benefits of choosing a four season room for your home is its versatility. Whether it’s sunny, rainy or snowing outside, you can take in the beauty of the outdoors from the comfort of your home. Unlike traditional sunrooms or home additions, a four season room typically costs less and takes less time to construct. Four season rooms add square footage to your home, giving you extra living space to enjoy, plus the added benefit of increasing your home’s value and improving its curb appeal. Whether you are looking to add space for a family room, workout room or a reading and relaxation space, a four season room could be a perfect addition to your home. Planning outdoor parties can sometimes be difficult, especially with any unexpected changes in weather. Even when it doesn’t snow or rain on your party, the bugs always seem to invite themselves to your get-together. Adding a four season room to your home can relieve your stress of planning around unpredictable weather while still allowing your guests to enjoy the beautiful outdoors from inside. At Patio Enclosures, we offer endless design options to ensure your four season room perfectly fits the design and style of your home. Glass options: We offer two different superior glass options for you to choose from. 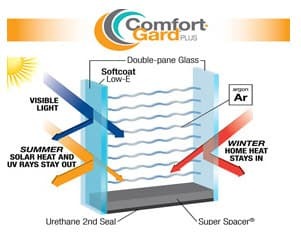 Double-pane insulated glass comes standard with this room, however, we also offer a Comfort-Gard® PLUS high-performance glass and glass tints. 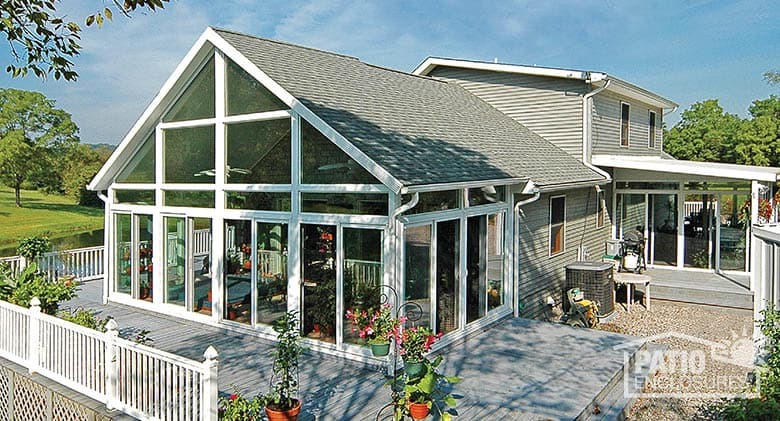 Glass is the main component of your sunroom and safety is always a concern. Each of Patio Enclosures’ exclusive glass options are tempered for your safety. Roofing options: The roof is another key component of your sunroom. When planning your room, our design consultants will provide recommendations, keeping in mind the overall look and design of your home. Our four season rooms come standard with 6-inch-thick insulated panels with structural I-beams and thermal barriers that provide you with maximum insulation to keep you and your family comfortable. The I-beams also provide maximum strength and stability for your roof, which allows you to construct a larger room. Roofs can be either sloped or gabled depending on the style of your home and your budget. Patio Enclosures also offers custom roof options that enable you to accent and complement the style of your home. 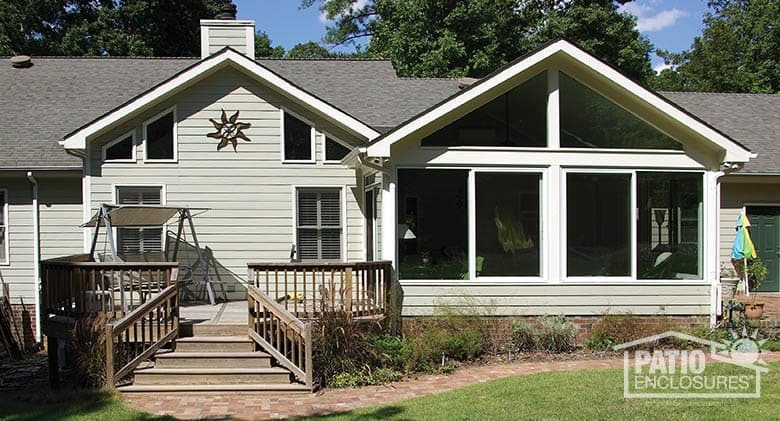 If you have an existing porch or patio roof that you would like to utilize, we may be able to construct a new sunroom without having to build a new roof as our enclosures are exceptionally versatile. 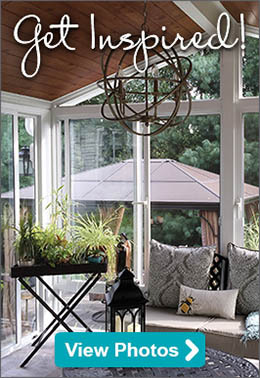 Vinyl or aluminum frames: Glass panels will form the walls of your sunroom, allowing for a full, unobstructed view. The room and windows are built and held in place with a frame, made of either aluminum or vinyl reinforced with aluminum or steel. Our vinyl four season rooms are the perfect addition for a vinyl-sided home. The vinyl doors and exterior finishes stay looking like new and are virtually maintenance free. Our vinyl doors are also structurally stronger than competitors’ due to our factory-welded corners that last a lifetime. Patio Enclosures four season aluminum rooms are built with the highest resistance to scratching, fading, peeing and chipping in the industry. Both four season room addition options are designed to be heated and cooled year-round. 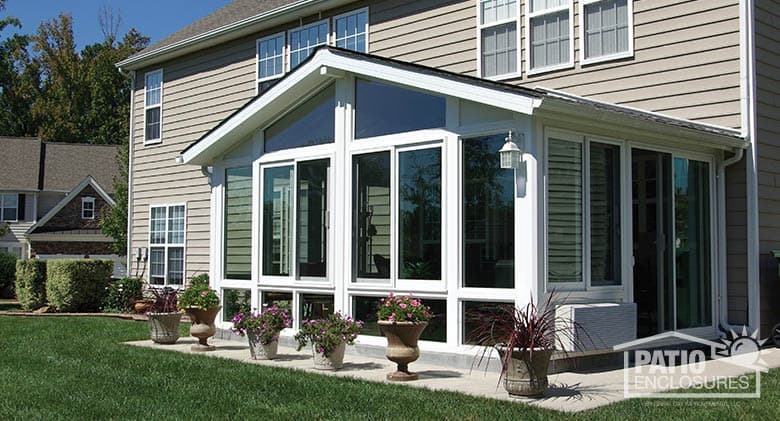 At Patio Enclosures, it’s important to us that you understand each type of sunroom and the options available to you, in order to create a space that feels like a true extension of your home and fits within your budget. If you’re ready to add a custom-designed, custom-manufactured four season room addition to your home, give us a call or schedule your free, in-home estimate online today.